Kohn in her laboratory, 1912. 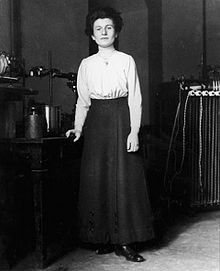 Hedwig Kohn (5 April 1887 – 26 November 1964) was a German-American physicist who was one of only three women to obtain habilitation (the qualification for university teaching) in physics in Germany before World War II. She was forced to leave Germany during the Nazi regime because she was Jewish. She continued her academic career in the United States, where she settled for the rest of her life. Born in Breslau (now Wrocław, Poland), Kohn was the daughter of Georg Kohn, a wholesale merchant of fine cloth, and Helene Hancke, a member of a well-to-do family. Her parents were both German Jews. In 1907, Kohn became the second woman to enter the physics department of Breslau University (Universität Breslau, now University of Wrocław). She obtained her doctorate in physics under Otto Lummer in 1913 and was soon appointed as Lummer's assistant. She stayed at the university's Physics Institute during World War I and obtained her habilitation in 1930. Kohn was trained by Lummer in the quantitative determination of the intensity of light, both from broad-band sources, such as a "black body", and from the discrete emission lines of atoms and molecules. Kohn was dismissed from her position in 1933 due to Nazi regulations which barred Jews from government service. She survived by fulfilling contracts for applied research in the illumination industry until 1938, when she found herself without work or financial resources. Offered temporary positions at three women's colleges in the United States through the aid of Rudolf Ladenburg, Lise Meitner, Hertha Sponer, the American Association of University Women (AAUW), and many others, Kohn left Germany. She had been given a visa to the United Kingdom in 1939, but it was cancelled because of World War II; she eventually secured a visa to travel to Sweden and immediately went there in July 1940. On receiving a visa from the United States, she then moved there. The journey to her first position at the Women's College of the University of North Carolina in Greensboro took Kohn through Berlin, Stockholm, Leningrad, Moscow, Vladivostok, Yokohama, San Francisco, and Chicago. When Kohn arrived in the United States in January of 1941, she was significantly unwell. After recovering, Kohn taught at the Women's College of the University of North Carolina at Greensboro for a year and a half. In 1942, she began teaching at Wellesley College in Massachusetts. Kohn established a research laboratory for flame spectroscopy while at the college. Upon Kohn's retirement as professor in 1952, Hertha Sponer, then professor of physics at Duke University in Durham, North Carolina, offered her a position as a research associate. Kohn set up a laboratory at Duke University and resumed research, where she guided two graduate students to their doctorates and recruited two post-doctoral fellows to assist in her study of flame spectroscopy. She worked there until very shortly before her death in 1964. Kohn was trained by Otto Lummer in the quantitative determination of the intensity of light, both from broad-band sources, such as a "black body", and from the discrete emission lines of atoms and molecules. She further developed such methods and devised ways of extracting information from intensity measurements and from emission line shapes. She wrote 270 pages in the leading physics text of the 1930s and 1940s in Germany, received one patent, and wrote numerous articles in scientific journals, some of which were still being cited into the 1980s. Two of her students became professors in Germany. After retiring from teaching, Kohn continued her research on flame spectroscopy at Duke University, ﻿“measuring absorption features and concentrations of mostly atomic species in flames,” the JWA reported. According to the archives, Kohn’s research “experienced a renaissance in the 1960s in the framework of combustion science and plasma physics,” and led to more than 20 publications, including multiple chapters in physics textbooks. While her textbook contributions aren’t widely used anymore, Kohn is still considered a pioneer in the field of physics.